In the most serious development in a week of scandalous revelations, it emerged that Minister Shatter has ignored allegations of serious Garda [police] misbehaviour despite receiving a dossier of such cases two years ago. Fianna Fail leader Micheal Martin sent the documents to the Taoiseach, which were passed to him from Garda whistleblower, Sergeant Maurice McCabe. The document contains evidence of the mishandling and subversion of a number of Garda investigations into assault, sexual assault, abduction and murder. In the dossier, among other serious incidents, it is alleged that Gardai could have prevented the murder of mother-of-two Silvia Roche Kelly in 2007. Other allegations include corruption of evidence, the destruction of evidence, police malpractice and deceit. Enda Kenny said he would “very carefully” consider what he described as “extremely serious allegations”, but expressed full confidence in the Minister for Justice and said he saw no reason why he should answer further questions about the scandal in parliament. But with mounting evidence of a high-level cover-up, Fianna Fail and Sinn Fein have called for the Minister to step down immediately. In recent years, the GSOC [Garda Siochana Ombudsman Commission] has struggled to hold the 26-County police accountable, clashing with the Garda chief Martin Callinan and with Minister Shatter himself. Last week, the Minister attempted to belittle and undermine a report which found that the offices of the GSOC had been subjected to government-level surveillance. The reason the GSOC ordered a sweep of their offices was reportedly because they believed senior Gardai had accessed private documents contained only in their files. In an attempt to put a lid on the scandal, the coalition government announced on Tuesday that it would hold a ‘review’ of the bugging crisis under retired High Court Judge John Cooke. That move was condemned by the opposition parties as “half-baked”. But that issue was quickly surpassed when a transcript was read by Micheal Martin into the parliamentary record of a conversation between the ‘Confidential Recipient’ -- an independent appointee tasked by Minister Shatter with receiving confidential reports of corruption and malpractice within the police --- and Sgt McCabe. In the conversation, Sgt McCabe is advised to remain silent on his allegations or the Minister ‘will go after you’. 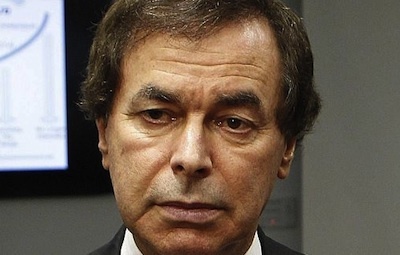 “If Shatter thinks you’re screwing him, you’re finished,” he is told. On Wednesday, Shatter suddenly sacked the Confidential Recipient -- barrister Oliver Connolly -- without explanation. A second Garda whistleblower, John Wilson later described Mr Connolly as “a scapegoat” who had acted only out of concern for Sgt McCabe’s welfare. Fianna Fail has called for a comprehensive statement from the Minister on why he had fired Mr Connolly and sought an independent commission of inquiry to investigate the allegations of misconduct. Seven independent deputies also said Shatter’s position had become untenable, as did Sinn Fein. “He has to go but this series of controversies is much more serious than the position of Alan Shatter,” said Sinn Fein’s Padraig Mac Lochlainn. “It is now about the confidence of the people in the administration of justice and policing in this state. “The approach that the Minister has taken has seriously undermined that confidence. “This Government must move to instigate a Commission of Investigation under the legislation into this whistle blower and Garda Confidential Recipient affair. “The half-baked review under Judge Cooke of the GSOC bugging scandal is just not good enough to restore confidence. “Why has Minister Shatter avoided utilising the Commission of Investigations Act 2004? “Under this act, the person or persons appointed to conduct the investigation can compel all witnesses and documentation and make findings of fact without huge cost and in a timely fashion. “This legislation is custom made for this moment. “This should have been the Minister’s first port of call when looking to establish the mechanism for investigation. It is just outrageous that an inquiry has not been established under its provisions.